(1 Customer Reviews) | Write Review 12 issues per year Military Modelcraft International is the UK’s leading military modelling magazine, with a truly global reach attracting the best modellers in the world to its pages. Each month MMI brings you a mixture of in-depth build articles, reviews of the latest kits and accessories, superb reference articles, and reports from model shows across the world. MMI’s focus is on providing you with the inspiration and knowledge to improve your own modelling skills and gain more from the hobby whether that be from archive photos and references or modelling tricks and tips. Military Modelcraft International is the UK’s leading military modelling magazine, with a truly global reach attracting the best modellers in the world to its pages. Each month MMI brings you a mixture of in-depth build articles, reviews of the latest kits and accessories, superb reference articles, and reports from model shows across the world. MMI’s focus is on providing you with the inspiration and knowledge to improve your own modelling skills and gain more from the hobby whether that be from archive photos and references or modelling tricks and tips. 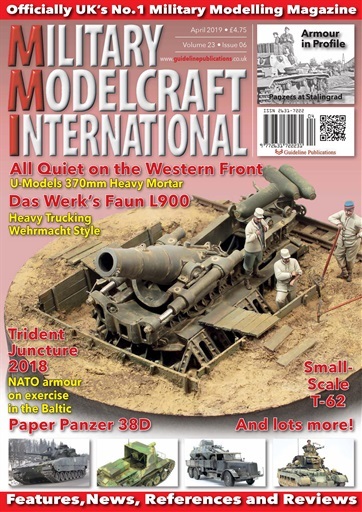 You'll receive 12 issues during a 1 year Military Modelcraft International magazine subscription. 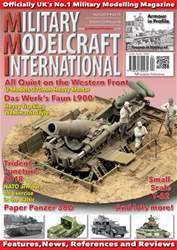 You'll receive 12 issues during a 1 year Military Modelcraft International magazine print subscription.